Making fudge correctly is a very satisfying experience but the road to perfect fudge is fraught with peril. If you have never made traditional fudge before, or your fudge never sets, these guides should set you straight. There is nothing wrong with “no-fail fudge” (which usually contains marshmallow creme), but my goal is to master traditional fudge. After reading it you will hopefully have a better understanding of why fudge works the way it does, and be on your way to a lovely block of fudge. Recipe links at the end of the course. If you have any questions leave them in the comments. 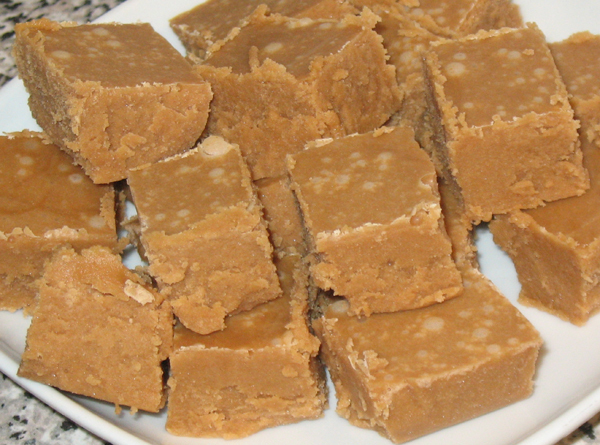 Fudge is a creamy crystalline sugar candy. It’s soft enough to melt on the tongue but firm enough to hold it’s own shape. Fudge does not need to be refrigerated, however it will go stale and is best consumed within one week. Fudge will last longer in an airtight container with the layers separated by wax paper. If you’re giving fudge as a gift, tightly wrap the pieces in plastic wrap before putting it in a box. What is fudge made from? * Some recipes use sweetened condensed milk, or evaporated milk. How do you make fudge? All the ingredients (except the vanilla, and optional ingredients) are combined in a pot on MED heat, and stirred frequently until the mixture begins to boil. At the first sign of a bubble, remove the spoon. If you live at high altitude or in a humid climate, it really depends on the recipe. You will need to make adjustments to the temperature but how much depends on altitude and humidity, so I’d get googling before starting. Let’s move on to Fudge 102.